As you grow in life and get more and more responsibilities, it becomes hard for you to line-up things in a proper way and focus on the key important task for life to become successful. It is required that you keep everything aligned in a proper way which can take you to key goals of life. It is best to keep the top 5 priorities for each quarter of your life. No more than five and also find one key goal of this 5 priorities. Finding this top five priority for each quarter of your life and business, the first step you need to do is to set 3 levels of goals. The first level of goals is long term goals which you want to achieve in the timeframe of the next 10-15 years. The second level of goals are short team goals which you want to achieve in the next 3-5 years and finally the last is immediate goals which you need to achieve in next 1 year. All this three level of goals should be aligned with each other and contribute to your long term goals. Once you have defined these three goals now start defining the top 5 priorities for yourself which will help you to achieve them. 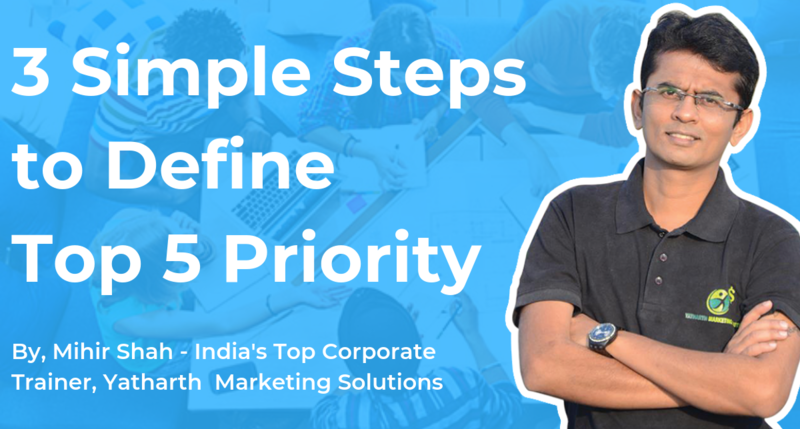 Based on your goal which you want to achieve in particular year which is contributing towards your success, you should define top 5 priorities on which you are going to focus for the present quarter. Make sure that this priority is not just words but it is more than that and it should give you enough excitement for doing it rigorously. If you have the goal to become CEO of your present company in the next 10 years and for this quarter you have Leadership quality as the task which you want to achieve as topmost priority. Instead of putting leadership, put single goal that on daily bases you will like to get positive feedback from each client you talk or colleague you work with. This will help you to think out of the box and help them with proper advice which will in a way help you to achieve your end goal. To achieve success in your life, you can’t work alone. You will need others to support you and contribute to your goals which can take you to success. Involving others and convince them to work for your success requires skill. Most people don’t like to work with anyone including their close relatives or employees. This is the major reason that only 1% of the total population of the world holds 80% of the income and rest remains in 20% with no successful or less successful life. To become successful, you need to be around good people who can help you in personal and professional life. In professional life you need to go with people who can take responsibility of your goals and achieve them, at times hiring those people will be bit expensive but you need to understand that by hiring people at close to minimum wages as possible is easy but will not contribute toward your success in a massive way. Once you get those people around you, start handing over things to them with details that they will need and give them the authority to act as required. By doing this you can focus more effectively on your long term goal and have quality time to think innovative ways to achieve them. Once you have decided the top 5 priorities for the quarter and delegated it in the most appropriate way by keeping few under your control and few to others, now key part is to make them achievable. The best way to do so is daily and weekly rhythm which will help you to check how much you have achieved, what is pending and who had done what. This is one of the simplest ways to achieve great success. If you have any personal life goals then discuss them regularly with family, assign responsibilities to each member based on their role and check how much you all have done and what is pending. The same thing applies to your professional goals and with your team.